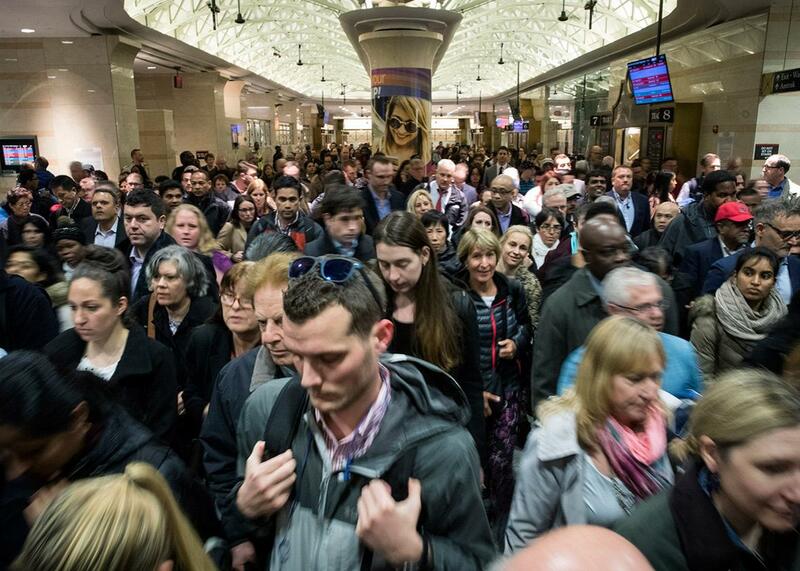 From subways to Penn Station, NYC transit is a mess. The subways are a mess. Penn Station is a disgrace. Who is to blame? Evening commuters make their way toward a New Jersey Transit train platform at Penn Station in New York City on April 4. As a Californian who is forced to drive more than I would like, I always look forward to my trips to New York City. I can jump on the subway to Brooklyn—which I have been told is actually part of the city—and visit my Slate colleagues whose faces I view too infrequently. Last month, however, I got a brief taste of what New Yorkers’ have spent their spring complaining about—and with good reason. The state of the New York City subways is a disgrace: Trains are old, delays are frequent, power outages are common. And even though Gov. Andrew Cuomo oversees the Metropolitan Transit Authority and needs the votes of NYC’s large population of Democrats, he has seemed reluctant to tackle the problem. Plus there is the mess that is Penn Station, which has left suburban commuters bracing for a “summer of agony” as repairs get underway to restore service to its old status quo, which wasn’t good to begin with. To discuss all this, I spoke by phone with Benjamin Kabak, who edits the Second Ave. Sagas Twitter feed (@2AvSagas) and is an expert on NYC transportation. During the course of our conversation, which has been edited and condensed for clarity, we discussed whether Cuomo is really to blame, the hell of Penn Station, and what Trump could (but won’t) do to fix some of New York City’s problems. Isaac Chotiner: How precisely would you describe what the hell is going on? Benjamin Kabak: That’s sort of the multibillion-dollar question. From a day-to-day perspective, what’s going on is that the once-reliable New York City subway system is showing its age and a lack of investment in such a way that service isn’t dependable anymore. You have constant delays, constant service reroutes. So the millions of people who rely on the subway to get around are suddenly faced with much longer commutes and much more uncertainty and an element of surprise that people do not want to schedule into their daily trips to work or home or school. It seems like a lot is happening at once. Is this because the problems feed on each other, or that we are more aware of it, or is it a coincidence? I think some of it is awareness. You have a louder drumbeat of these problems, especially on social media, where everything unfolds in real time and people are paying more attention to it. But it’s also that the system components that are breaking down are all sort of around the same age and have all sort of suffered through the same lack of investment over the years. It’s not that much of a coincidence. You have a system that has had a huge increase in ridership, and as it has increased, the MTA has invested in certain elements of the system, like new train cars and some station components that have been upgraded. Some things run much better than they did in the ’70s and ’80s. But the underlying backbone of the signal system is 80–100 years old, and these are components that are breaking down more frequently and much harder and more expensive and more time consuming to replace. So is Cuomo himself to blame, or is the fact that you have a system that is controlled by the governor to blame? I think the governor in the short term is to blame. He has been very focused on the flashier elements of transit. He likes his ribbon cuttings. He likes his bridges with their flashing lights. He likes being in charge of the Second Avenue subway when it got him favorable headlines. But he hasn’t done a very good job of supporting the MTA on a day-to-day basis and really making sure that the agency is enjoying the political support that it needs in Albany to push projects through. But at a certain level it’s a little unfair to target him specifically because it has really been a history of disinvestment. You can trace it back to Robert Moses and this lack of investment in transit that goes back to the ’50s and was exacerbated in the ’60s and ’70s when the MTA should have been thinking about replacing and modernizing the signal systems and didn’t have the money to do so. Cuomo’s lack of empathy and support for what New Yorkers are going through is an accumulation of 50 or 60 years of governors not investing in transit or paying the right attention to it. You mentioned investment, but I read on your Twitter feed that you don’t think investment is the problem per se or rather that more funding would not necessarily solve the problems. One of the challenges that I think advocates of the system have is that there is an idea that if you throw more money at the MTA then things will magically be fixed. But the MTA has access to a lot of money. They have a five-year, $30 billion capital plan, and while some people say the proper amount would be closer to $50 billion, the underlying concern is that the MTA can’t spend money very well. Everything it does is far more expensive than its peer cities. Everything they try to do in terms of construction takes far too long. So why can’t they spend it well? That’s a tough question and one nobody has been able to pinpoint. You have a lot of different factors. Projects in New York take a lot of planning. You have environmental regulations. You have old city streets and nobody knows what’s under them. You have old buildings that are nearby. You have this [not-in-my-backyard] reaction to everything when it’s a heavy construction project. You have lawsuits. You have what I call institutionalized corruption. There are only so many companies that are qualified to take on things, which leads to a bidding process where the bidding process is very inflated. What about the projects Cuomo cared about? Have they been pulled off with less trouble, or did they have the same problems? It’s the same problems. The Second Avenue subway, which sort of opened on time, was actually four years late. It opened on a new schedule that they had put forward when it became apparent they were going to blow past the original schedule. It was well over budget and the most expensive subway line built in the world. You have the same problems with the bigger projects, but they are out of sight. You don’t miss something you don’t have. In terms of who pays: Are suburban riders paying enough, and should fares be subsidized for poorer riders? The riders themselves have borne a fair share of costs. And it’s all part of the same regional economy. You need to make sure people can get into their jobs in New York City, or we will all suffer. I am in favor of subsidizing fares for lower-income riders, but that is something that hasn’t gained much political traction from either the mayor or the governor. Has the terrible relationship between those two guys exacerbated the crisis? Oh, absolutely. Cuomo is trying to get more money out of the city; the city is pointing fingers at Cuomo. The MTA is sort of set up where no single politician has to take responsibility for it, so everybody is finger-pointing. How would you describe the state of Penn Station, and is it uniquely awful or is it a good stand-in for many of the infrastructure shortcomings in America? I think it is somewhat emblematic of the general state of transportation infrastructure, but at the same time it has really become a huge chokepoint. It’s a station that is run by three different agencies. The tracks are owned by Amtrak, but the MTA and New Jersey Transit both operate out of Penn Station. And you have had so many problems with aging infrastructure that it has become unsustainable. Amtrak has to perform two months of repairs this summer and shut down a bunch of the train service that comes through it, but it is also the busiest train station in the country. It is a huge chokepoint of the American economy and New York economy and needs to be resolved. If Trump were a rational actor, is there anything he could do help New York City with its transportation problems? What you would need—and unfortunately the reality right now is that Republicans are not particularly focused on urban issues, because that’s not where their base is—is an infrastructure bill with robust federal investment in transit, with a focus on the Northeast corridor, where they would say they would fund Penn Station and fund this new gateway tunnel, which is Amtrak’s plan to build new tunnels. You are looking at around 110-year-old tunnels that are at risk of failing. I don’t mean the ceilings will collapse and trap people, but I mean the infrastructure inside will not be able to support the number of trains that pass through it. That’s what you see at Penn Station. The problem is that you don’t have a party or an administration that is particularly sympathetic to urban investment issues right now.